What is animal abuse ? Various ways adopted for animal abuse. Animals are used for different experimentation. During testing animals suffer severe pain. The use of animals for entertainment is not ethical. Must create greater awareness about the sufferings of the animals. under global microscope. The issue of substituting animal for gaining medical or monetary benefits is typically unethical. Though there are many organisations and people supporting animal abuse considering the intends and benefits such as assessing the effectiveness of a newly discovered drug, illegal trading of animal parts, raising funds for illegal armed forces, generating revenue through shows, circus etc. 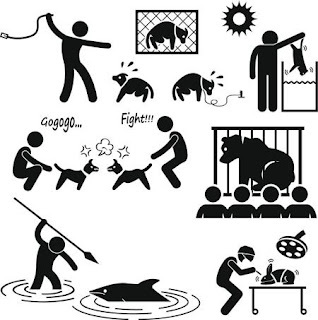 Animal abuse can be broadly studied under three aspects namely, animal poaching and trafficking for illegal purposes, animal objectification for experiments and ill-treatment towards animals for entertainment purposes. Animal abuse is a worldwide problem with severe consequences. Animals are being beaten, starved, caged etc every single day resulting in death. The world has advanced beyond the imaginations and yet strives to rise higher. Science has played a vital role in the development of the society, country and universe and has become a necessity of life. Though humans leave no stone of experiment unturned but no success at the cost of an animal's life or suffering is worth. Scientists and various organisations have adopted the practice of objectifying animals such as monkeys, rats, mice, cats etc. for testing drugs, effectiveness of a newly discovered product, degree of damages, benefits of medicines etc. Not just science and development, even big cosmetic companies are a part of the inhumane act of reducing animals to mere tools of experimentation. The animals used for such experiments or testing are traumatised. They endure severe pain, hair loss, vision loss, burns, rashes etc. Researchers and scientists have very easily rushed and out done their acts under the name of science and development. The experiments leave animals to suffer painful sickness for days, weeks and months till they die. Neglecting and forcing a living creature to struggle for life without food and water for a monetary gain or discovery is absolutely cruel on the parts of human. Animals also suffer due to the neglect or lack of action by humans. Examples include starvation dehydration, untreated medical emergencies, inadequate shelter in the times of need etc. During the process of testing, animals are subjected to different types of atrocities which may cause moderate to severe suffering among them. The experiments include injecting or force feeding animals with harmful substances, intentionally infecting the animals with diseases, exposing the animals to radiations, poisoning in order to check the toxicity. Some animals are subjected to severe suffering such as long-term isolation, withholding the food and water, separation of the new born from mothers, and repetitive electric shocks in some cases. While checking the toxicity levels of a drug, animals have to be infected with the test substance on a daily basis subjecting the animal to its harmful side effects. The test procedures may last for hours, days, weeks or in some cases extend up to years, depending upon the type of study being conducted. Many of the animals are unable to survive such harsh treatment and die before the study ends. There are experiments that make use of restraining devices, which are the special devices designed to immobilise or restrict an animal from moving. Sometimes specific parts of the animal's body such as head, neck, legs, pelvis or arms are immobilised. Many of these experiments are conducted without the use of local or general anaesthesia making it all the more painful for the animal. Animals abuse is not only restricted to performing experiments on them but it spreads in the form of animal trafficking as well. Animal trafficking refers to hunting i.e. illegal poaching and trade of animals for intended human benefits. It is usually propelled by groups committing atrocities. Wildlife trafficking is an issue of serious concern as it involves money laundering to potentially harmful groups and organisation. According to a survey, illegal wildlife trade is ranked as the fourth largest illegal market in the world, estimating to be a $ 19 billion per year industry. Killing animals for trading their body parts to fund illegal and criminal activities is completely unethical. Global atrocity prevention, conservation and anti corruption movement can al 0 put in joint efforts to combat wildlife trafficking-both for the sake of 4 biodiversity of animal treatment and for starving dangerous groups funding r-/ and ending impunity for those who threaten wildlife. Another aspect of animal abuse is use of animals for the purpose of entertainment in order to produce revenue. Circus, amusement parks, zoos etc are everyday options available in each and every state of the country today. Though many people enjoy watching animals perform in a certain way, they are ignorant of the back stage torture these animals go through. To name a few, tigers, elephants, dolphins, can be sighted very easily at these spots. Every major circus is witnessed for violating minimal standards of care set of animals. Most rodeo events rely on creating a stressful environment for the domesticated and often docile animals involved. Participants rely on harsh handling practices such as twisting calves, tails or giving painful electric shocks for making animals perform under fear and stress. With all the abusive acts by humans on different fronts and activities, animal cruelty is on a rapid rise. As individuals, we need to contribute in ways as boycotting animal tested products and medicines creating greater awareness about the ill-effects on animals, under-taking and promoting ethical substitutes for research and encouraging revision for strict laws against such heinous activities. We must bear in mind that animals, too, are living creatures with the same senses as humans. Rodeo a public competition, especially in the US, in which people show their skill at riding wild horses and catching cattle with ropes.